Why is demand increasing for ethnic produce in the mid-Atlantic? U.S. Census data indicates New York City, Washington DC, and Philadelphia are among the top ten cities that are majority-minority in population, meaning ethnic minorities account for more than half of the population (Census 2010). U.S. Census data also shows that the mainstream population only increased by 9.7% from 2000 to 2010 as compared to 43% for Asians and 43% for Hispanics (Census 2000, 2010). With this increase in population, there certainly would be an increased demand for ethnic produce and therefore more economic opportunities for producers, wholesalers, and retailers who grow and sell these products. To address this increased demand for ethnic produce, researchers at Penn State, Rutgers, the University of Florida, and the University of Massachusetts along with industry members (including farmers, retailers, wholesalers, distributors, etc) gathered earlier this year to discuss research data and trends related to ethnic crops in the mid-Atlantic at the 2014 Ethnic Greens and Herbs Workshop. One of the projects developed by the research team was the Worldcrops.org website. The World Crops site provides information about vegetables and herbs that can be grown in the northeastern United States. The emphasis is on crops that are popular among ethnic groups living here and can be grown here. The site is organized by country. Another helpful aspect of the site is the glossary which is available in English to Spanish and vice versa. A user can easily find the English or Spanish name for a particular type of produce as well as the genus and species of more than 350 entries. 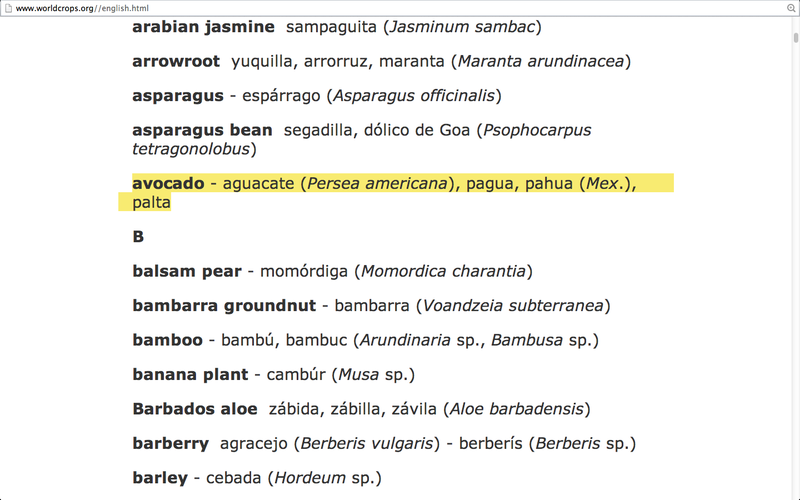 Example 1 shows that an avocado is called an “aguacate” (Spanish), “pagua” (Mexican), or “pahua” (Mexican) and the genus and species is Persea americana. Example 1. 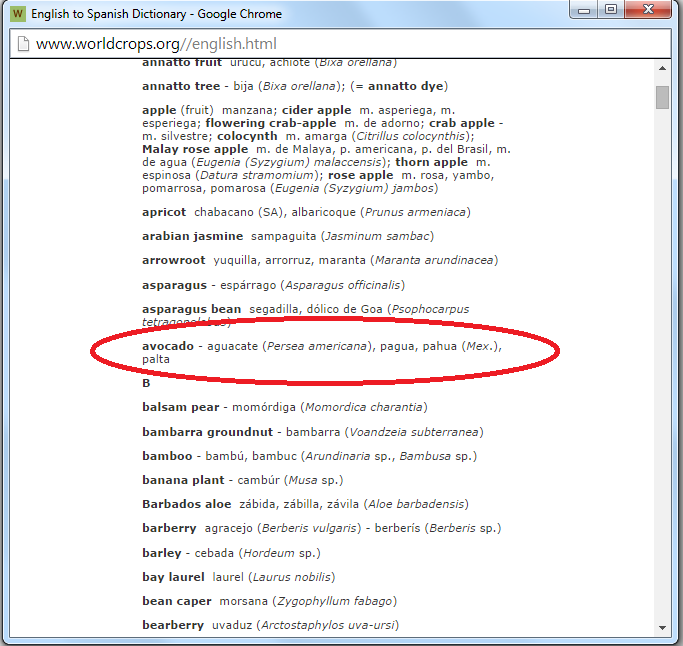 Screenshot of English to Spanish glossary on Worldcrops.org. Visitors can also find ethnic crops based on the country of origin. In the “Go to region” box on the main page, visitors can click on a region and then select a country. In example 2, Brazil is shown. The language spoken is Portuguese and some of the main crops used in this country are listed including cilantro, maxixe, and okra. Example 2. 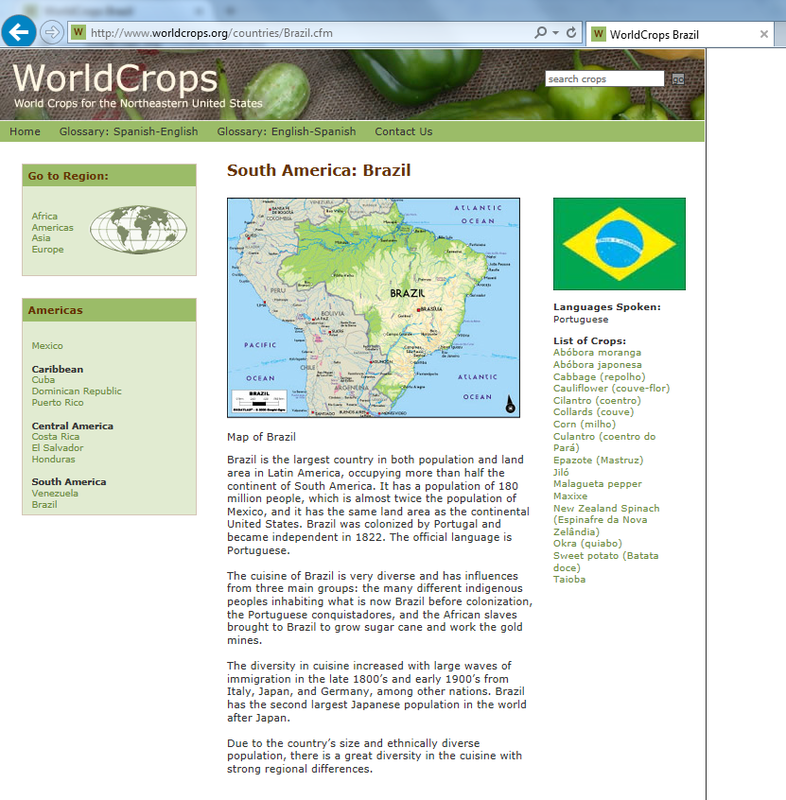 Screenshot of "Go to region" listing for Brazil on Worldcrops.org. If you are an ag entrepreneur and are interested in exploring ethnic crop opportunities, it's imperative that you DO YOUR RESEARCH as you would with trying any new opportunity for your business. Good luck!